Whether you’re an IT manager, an Engineer, or a DevOps guy or gal, there’s a good chance that from time-to-time, you or someone on your team has stopped whatever they were doing to take care of the less-than-glorious task of ensuring all production servers are still covered by their Dell service contracts or HP warranties. No matter what you call it, none of us ever want to be caught running on an unsupported server or out-of-warranty network hardware in most any role, never mind in a production critical one – (we prefer spending weekends outside the office)! Second, only to a detailed inventory of all the IT assets you own and their overall utilization for managing the scale of your deployment in response to load and other factors, it’s imperative to know that all of your hardware is reliable. Your customers, and ultimately your company depend on it! Whether you think about it as it HP warranty check time, or time to renew your Dell service agreements. However you refer to it, the fact of the matter is that it’s a necessary part of your hardware’s lifecycle, and your overall ITAM strategy. How do you check your current Dell Warranty and HP warranty statuses? Be it an original purchase warranty, or coverage under an extended support contract, ensuring your hardware (and software!) support contracts are current is very important to get a good night’s sleep for any of us in the systems administration business! No one wants to have a RAID drive failure happen (or, god forbid, a multi-drive failure) in their SAN overnight and have to scramble to do an HP warranty check or Dell warranty lookup, then rush to locate the proper replacement hardware before another failure occurs. There’s a real comfort in getting to work and finding the auto-shipped replacement drives on your desk, ready to drop in. It’s no fun arguing with a support representative to justify a switch replacement because we forgot to check our Dell warranty status; we all have enough to worry about! That said, how do you currently keep track of your HP warranties and HP service contracts? Don’t fight with your “warranty tracking spreadsheet” any longer. Don’t waste time digging through old emails, only to have to then painstakingly match each warranty renewal confirmation you uncover to a hard-to-locate serial in your datacenter. But we’re getting off track. There are lots of manual, unpleasant, and monotonous ways to manage HP warranty details or Dell service contract entitlements. Whichever method you’ve used in the past — good news: There’s a better, and easier way! But Device42 takes it a step further! As long as the model field is correctly set to HP or Dell, and a valid serial number populates the CI’s (configuration item) ‘serial number’ field, Device42 can quickly and automatically retrieve HP warranty and/or Dell service contract information! Not only will that information get auto-populated into Device42, easily viewable, searchable, auditable, and reportable, but Device42 can also let you know when it’s time to renew your HP support contracts or Dell support entitlement contracts! HP warranty checks couldn’t be easier! Simply request an API key from HP, input it into Device42, and run the warranty check from main menu: Discovery → Warranty Sync! Note: as of 12-2018 HP seems to have changed their API key process; request an API key from HP here, or get an API key for Dell here; reference these instructions from HP or the D42 docs link directly below for detailed instructions! Your API Key is storable (using Device42’s built-in password vault functionality). Simply click the magnifying glass near the “access key” field. If you need more details on this step, see the HP warranty check documentation page here. That’s it – Really, that’s it! Schedule your HP Warranty Check jobs (or your Dell, IBM, or Lenovo warranty check jobs) if you so choose, and let Device42 take care of the rest! If you’d like an early warning if a warranty is coming up on expiration, simply schedule a warranty report to run regularly, and have the report emailed to an address you check! Device42 helps you automate sysadmin tasks! When it comes to automating the monotonous tasks that are necessary, but that IT Managers, DevOps folks, System Administrators, etc. alike would rather not do — Device42 has your back! Check back soon for more on other ways to make system administration easier, and be on the lookout for more tips on how to incorporate more automation into your IT environment! 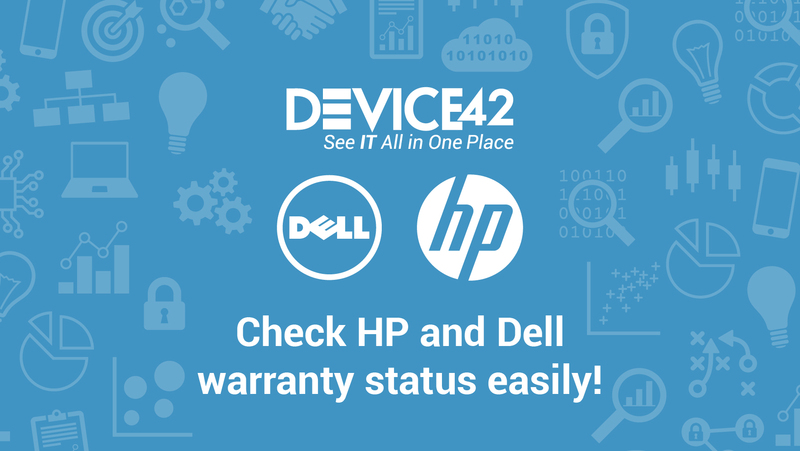 If you found the Dell / HP Warranty check script useful, tell a friend — and if you’re new to Device42, Download a free trial today!